When you're young, you will probably only know the horrible cover version of this song by Celine Dion. She did a very good job of murdering one of the most beautiful tracks ever recorded. 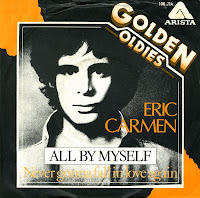 Eric Carmen released this gem in 1976 as his debut solo single. This 7 minute epic actually borrows from the second movement (Adagio Sostenuto) of Sergei Rachmaninoff's Piano Concerto No. 2 in C minor, Opus 18. Carmen believed that the work was in the public domain, but subsequently had to come to an agreement with the Rachmaninoff estate. Nonetheless, Carmen had a hit on his hands: the track peaked at number 12 in the UK singles chart and number 10 in the Dutch Top 40.